The name coralroot refers to the roots of the Coralroot Orchid plants, which are said to resemble coral - not that we have ever dug one up to prove the point. Less attractive than the other forms of Western Spotted Coralroot Orchid, the yellow spotless form is still a much larger and easier to find plant than its dull green diminutive European cousin, Corallorhiza trifida. Growing up to 12 inches (30cm) in height, both the size of the plant and the bright yellow colour make this easy to spot if you are lucky enough to be in the right place at the right time for the flowering of the Western Spotted Coralroot Orchid forms. We have also been fortunate enough to find Western Coralroot Orchid Corallorhiza mertensiana, another very attractive plant which also flowers at the same time as the Western Spotted Coralroot Orchid. There are four different 'forms' of Western Spotted Coralroot growing in North America. Their ranges extend from as far north as British Columbia and east to Newfoundland, and as far south as New Mexico. They also grow in California, Indiana, Arizona and Virginia. We have found and photographed two forms in the Rocky Mountains - forma intermedia; and forma immaculata - the one on this page. Coralroot Orchids occur in a considerable range of habitats from dark forest (where we found this one) to dune slacks and open tundra. Although they produce some chlorophyl (hence some plants are greenish, although many are purple-brown), these orchids are largely saprophytic, depending mainly for their food on the mycorrhizal fungi surrounding their roots. Coralroots are usually self-pollinating. 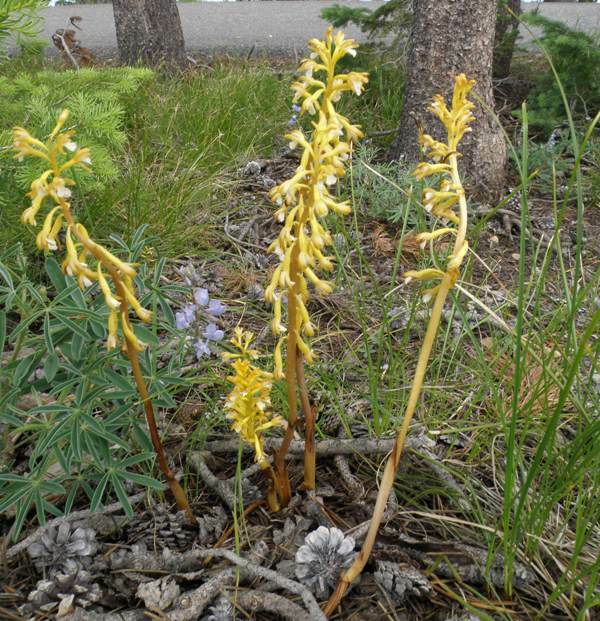 The yellow spotless form of Western Spotted Coralroot Orchid in woodland near the border between Yellowstone National Park and Grand Teton National Park. 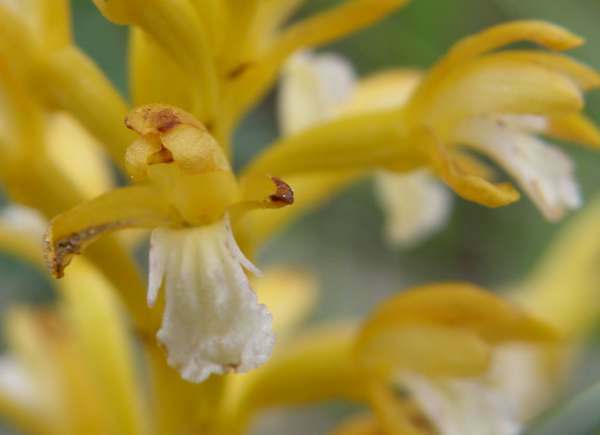 The bright yellow stems and white, spotless lips of this form of Western Spotted Coralroot Orchid are the identifying features to look out for. The specimens shown on this page were photographed In Yellowstone National Park in early July.